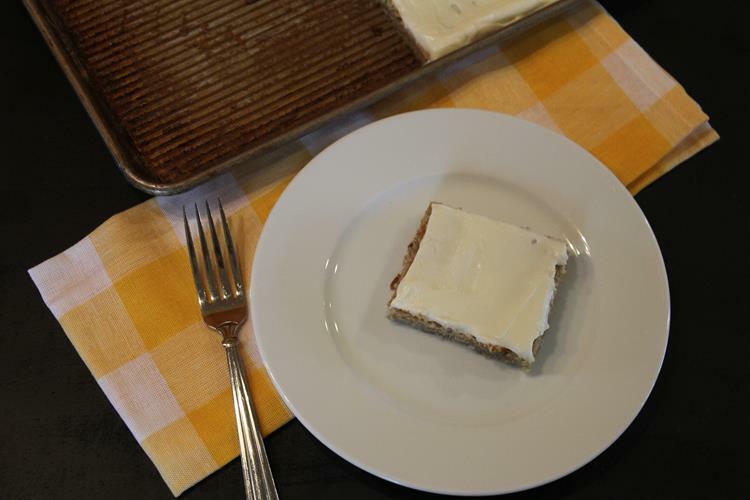 Frosted Banana Bars is a simple and delicious dessert to make and a great way to use up overripe bananas. We eat a lot of bananas around our house. My kids really like them. One of my daughters thinks she could live on bananas and carrots alone. Even though we all enjoy them there seems to always be one or two that end up being a little too ripe to eat. My husband actually prefers overripe bananas, but he does not always eat them up. I however like mine on the green side. I am one of those people that feels like bananas are good for about one day, because there is a fine line between too green and too ripe. I make a lot of banana bread and muffins, but we get tired of always having those too things. Smoothies are also a great use of bananas, but I think dessert is my favorite way to use them! If a dessert has bananas in it, it is healthy, right? Okay, so this is not healthy, nor is it low fat, but if you like bananas give these bars a try. This frosting recipe is one of my favorite frosting recipes. It is good on most cakes. It makes a boxed cake seem homemade. It is really good on carrot or zucchini cake. If nothing else try the frosting recipe. You won’t be buying the canned stuff anymore. 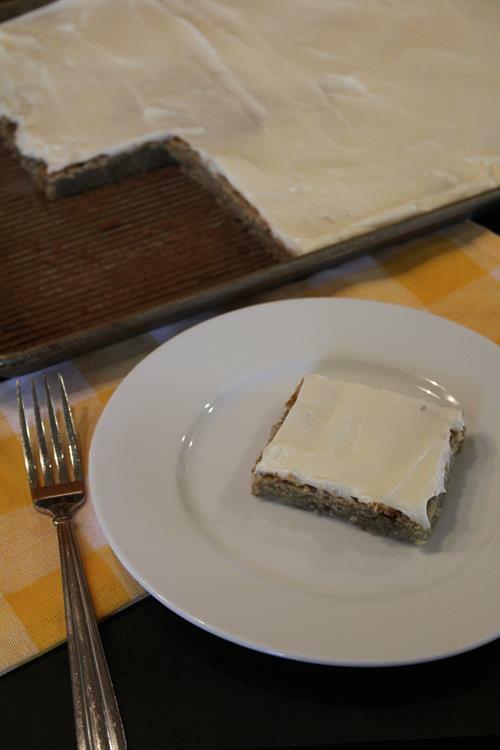 And I have a gluten free version of these banana bars so if you are gluten free be sure to check out my gluten free banana bars. I have also heard from readers that Bob’s Red Mill 1 to 1 blend works great in this recipe. So that is another option for those of you that are gluten free. Combine the flour, baking soda and salt and gradually add to the creamed mixture. Stir in bananas. 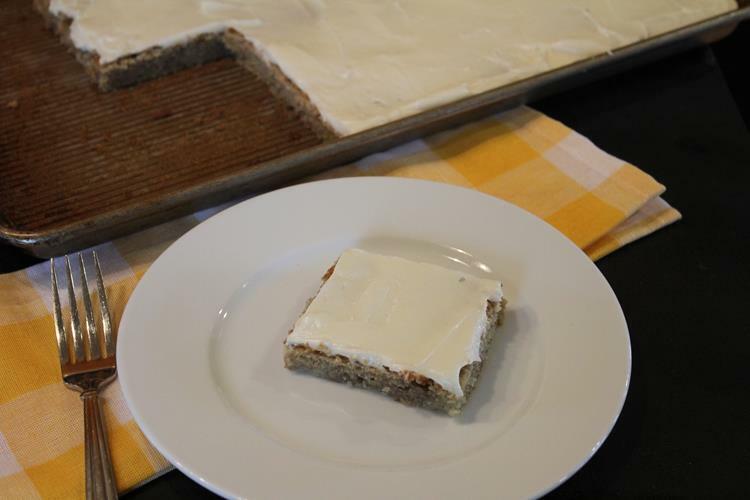 Spread into a greased 11×17 or similar sized baking pan. Cool and frost using frosting recipe below. For frosting, in a mixing bowl, beat the cream cheese, butter and vanilla. Gradually beat in enough powdered sugar to achieve desired consistency. Frost bars. i bet this would be yummy if you added mini choc chips to the cake batter. This recipe sounds great. I’m putting this on my menu plan/grocery list for next week. I happen to have a few “past prime” bananas on the counter right now. Thanks so much for the recipe, my family will be so happy. Mini chocolate chips would make it even better. Great idea. Lynn, tried these tonight and everyone raved. Thanks for a great recipe. Jill, I am glad your family like them! Thanks for letting me know. These are amazing! I even love them without the frosting, baked a little thicker. I just make these and they are FANTASTIC! I believe this is my favorite way to eat bananas! I am so glad you enjoyed them. They are one of my favorite ways to eat bananas as well. I want to let you know I tweaked this recipe a little bit and it came out great! For the flour I used Bob’s 1 to 1 gf flour instead of regular flour. I also added about 5 heaping teaspoons of ground flax seed to the batter. Thanks for letting me know that it worked well with the blend. This is one of my daughter’s favorite banana recipes to make. We love making the gluten free version that I have, but I love hearing that the Bob’s Blend works. It is my favorite gf blend. This sounds great, When my bananas start to turn a little brown I put 2 or 3 in a freezer bag, mash them and store in freezer, it works fantastic and I always have some on hand , They do turn brown but that is fine and they taste just like fresh bananas in banana bread or cakes, I will be trying this recipe soon!! I hope you enjoy it! It is one of my favorite ways to use bananas.